Few things say summer more than fresh Sullivan’s sweet corn! Our summer produce business started in front of a hand-me-down wagon. Now, almost 30 years later, we grow over 10 acres of various varieties of sweet corn to sell to both our retail and wholesale customers. At Sullivan Farms, we harvest our sweet corn daily. So, when you chose to buy our corn you know you are buying it fresh! Devotion is a high quality white super sweet corn with superb eating quality. It has 8-inch ears with a nice husk package and good tip cover. 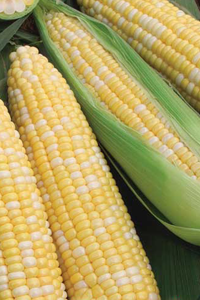 Devotion has 16 to 18 rows of attractive, bright white kernels and makes the perfect side for your summer cookout! Sold by the dozen, at $4.50 per dozen. Bodacious produces huge ears that you'll want to savor until the last bite! These tender 8-inch ears are filled with about 18 rows of bright yellow kernels, all bursting with sweet flavor. Bodacious is great for fresh eating, freezing and canning. Obsession certainly earns its name. One bite and you’re be hooked! This traditional sweet corn comes in 8-inch ears with a mix of yellow and white kernels. Once again, Obsession is great for eating fresh, freezing and canning! Passion is full of plump kernels and a bold taste that will have you coming back for more! Paired with butter, salt and pepper, these 8-inch ears are hard to beat! We take orders over the phone. That way, when you arrive your order is ready to go! Call (919) 284-3680 to get Sullivan's sweet corn today!